I was not raised in a Christian family. My mother took me to a Methodist Vacation Bible School when I was very small, and my grandmother and grandfather would take me with them as well, but that was all I can remember. My dad was quite angry with God. When his sister was coming home from the hospital with her newborn baby, a train hit and killed them, and my dad never let God off the hook for that one. So it came as quite a surprise to all in my family when I became a Christian in 10th grade (1977). How that happened is the subject of another entry perhaps, but suffice it to say that I was so zealous for Jesus that my dad was convinced I had gotten involved in some sort of cult. Which means that the foolishness of youth coupled with a passion for my newfound faith paved the way for some mistakes on my part! I am glad the Grace of God covers a lot of foolishness too! Anyway, that bought me a ticket to counseling. Just so happened the guy was a Jew and had no friendliness towards Christianity, or faith of any kind. So when he asked me how things were at home, I made them sound pretty bad. After all, all things are pretty terrible when you are 16, right? When Ralph told me it was okay if I left home until things got better my dad took issue with that. I didn’t have to go to counseling anymore. So, in the summer of 1978 I had a job working in downtown Minneapolis. I lived 45 minutes away on a farm in Maple Plain with my dad and step mom. I remember the Monday or Tuesday when one of my tires developed this “flump” sound (new SAT word!) as I drove. I stopped to see what it was and was surprised to see this bulge coming out of my tire. I remember thinking to myself, “What the heck?! I never seen that kind of thing before! This cannot be good!” I knew the tire would not last long (they were all getting pretty old!) but I could not get new tires until I was paid on Friday. All I could do was pray, “Lord, please hold these tires together until I can get new ones! You are the only One who can do it!” That was all I could do. My dad was concerned about my driving the car in that condition. He was especially angry that I could have gotten tires right away but had given some money to church that Sunday (tithe). When I told him that God would hold it together until I got paid again, I could almost hear his angry thoughts – “Well, God sure didn’t protect my sister from that train!” He thought I was so irresponisble. There was nothing I could tell my dad. I had no easy answers. All I knew was that God was good, and that somehow I didn’t think that the accident was God’s fault, but that He allowed it for some reason. Pretty soon my dad saw some tires for sale complete with rims from somebody selling them in the paper. I remember they were just $100. I thought that was a pretty good deal with rims. Only problem was I had to wait until Friday to ge them. It was rather unnerving driving all those miles with that bulge hitting the pavement every time the wheel did one rotation. It was like hitting a balloon on the pavement hoping it would not break. 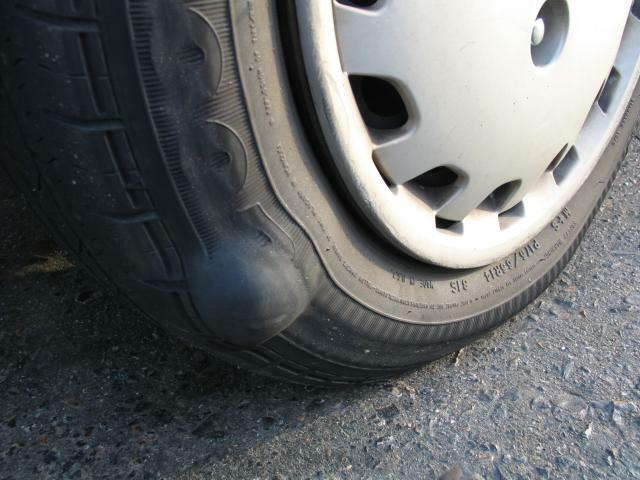 Looking back, I calculated that if I drove 50 miles round trip each day to work and back, that tire (assuming a 24″ diameter) with the bulge hit the pavement over 21,000 times each day – on hot summer pavement. Over a 3 day period that is over 60,000 times the grace of God covered me! Romans 5:20 tells us that “…where sin increased, grace abounded all the more…” Thank you for your goodness Lord! Friday afternoon I picked them up and took them home and my dad helped me change the tires. I will never forget the look on his face when he took the tire with the bulge off the car and laid it down. As he laid it down, the tire immediately started hissing like somebody was letting the air out of it. It went all the way flat. He had this look on his face of “You have GOT to be kidding…that is incredible!” I had this urge to say, “I told you so!” but didn’t want to get hit! God had held them together like I asked Him to. It was also a testimony to my dad of God’s goodness. Not that God was trying to be let off the hook – God does not need letting off of any hooks. In fact, he purposefully stayed hooked on the cross for all of us – dying in our place so that we might live. Not that chariots or horses are bad, but they can mask the person really behind the victory – God. It is not good tires that get me to work – it is God, though God may choose to use the tires. It is not my hand that makes my money, though God may choose to use the skill in my hands or the knowledge in my head, I acknowledge that all good things come from God. And for that reason, I praise and worship a God who is good. And He IS good – all the time. I am a recovering public school administrator who has an addiction to crunching data and running statistical analyses on that data, and making informed decisions based upon those analyses. I do the same thing with God's Word. I comb it for the heart of God - the love of God expressed in the pages of that book. Then, I use that love to transform my life, and the lives of others. God's Word is truly Powerful! When I find myself in a sticky situation, and my experience seems to contradict God's Word, I will always stick with God's Word, because my situation will end, but Jesus Himself said "God's Word lasts forever." It changes lives. In fact, "that's what God do!" He changes lives. He started changing mine 30 years ago, and by His grace I have beaten the odds and statistics of children raised in abusive homes, alcoholic homes, and other life-besetting circumstances. Those things do not define my life. God does. I will always do my best to believe God's report, not the world's. As I let Him have total control, I allow Him to continue to change my life - for the good. Join me on the journey! Be blessed this day with all the love and peace God has in store for you! Posted on August 22, 2011, in God is Good and tagged Tires. Bookmark the permalink. Leave a comment.